Background: Many people use many tools to manange their daily ToDo lists. Some of them use Evernote (EN). I'm one of them and have been asked to document my methodology together with some relating hints. All tags that describe "Done" states should start with the special character ">"
... and click on "My Todos in work" thereafter to display your current ToDos ? Even if you do not see your "ToDo list", you can manage it by changing tags of their items (notes). remove tag ">0-in-work" and add tag ">8-waiting"
continue with your next ToDo ? 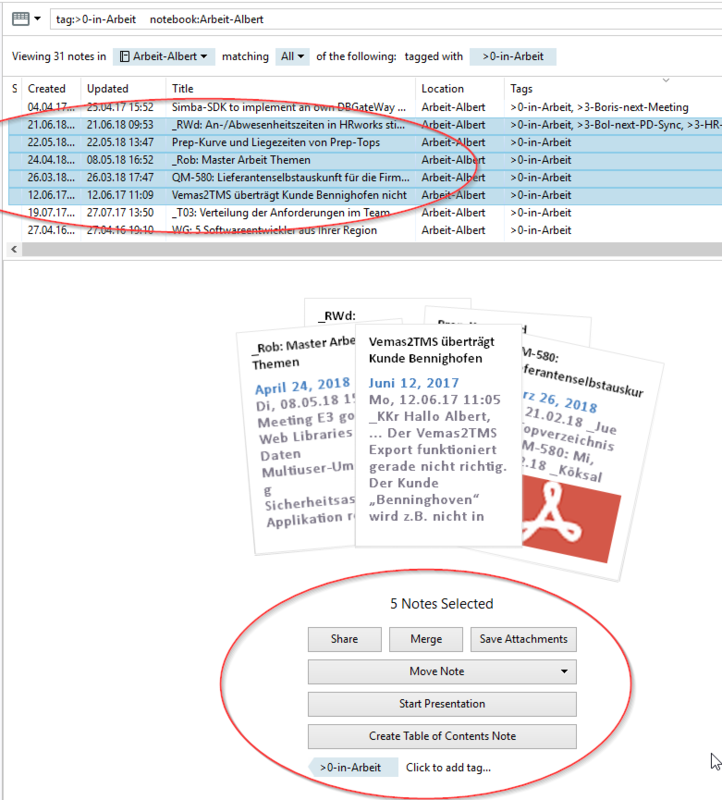 select all notes tagged with ">3-hr-meeting"
selecting all notes with tag ">3-hr-meeting"
Doing so, it's very easy to create dynamic ToDo lists for any purpose without re-inventing new tagging strategies for every new business case. Whatever works for people is the best system they should adopt, I am a firm believer in that. From my experience, I tried the 1-Next, 2-Soon.....etc. tagging for the timelines but it did not work for me. It was too much maintenance for me, I already feel like spending time for tagging completed and moving them to a completed notebook. Deciding on the timeline was adding to it and I was not really filtering to see what was next or now or soon etc. I was less disciplined back then too, it might work better for me now. I kept the "waiting for" tag which I still do not use to the best of its use but it still provides value for sure. OK, having too many next, over-next, soon and later goals is like an overcrowding in-work (as in my case ;-). I also do not work 100% regarding to my schema but it helps a lot to review the many tasks one might have. Have you ever detailed your process in some post? I am curious in particular about your use of the reminder feature. 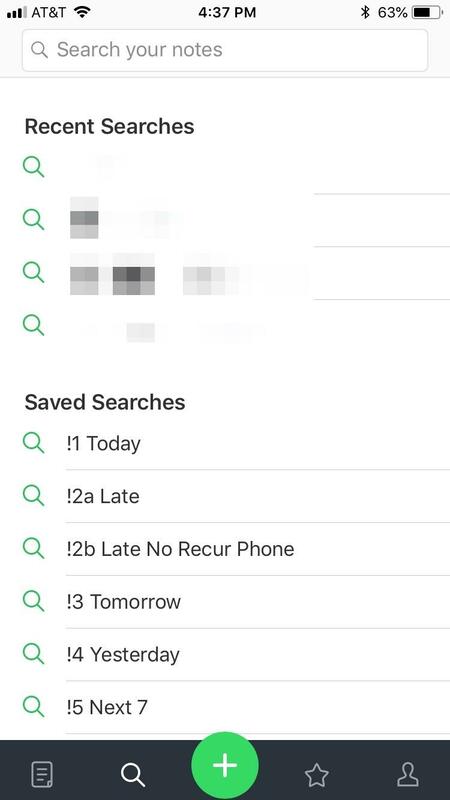 The special saved searches seem interesting, but my brief use of reminders ended up showing me upcoming reminders at the top of my lists that were 6 months to a year into the future, with no obvious way to control it besides changing the date of the reminder, so I deemed it useless and gave up. This excludes future dated entries. >>Have﻿ you ever﻿ detailed your proce﻿ss in some po﻿st﻿﻿﻿? The important point for me is to get a dynamic "due date" into the task organizing. In Windows of course to see future reminders you do a search, but in Android at the moment, I have a reminder at the top of the Note list for May 31st 2019, the only way I know to remove it is to mark it as done. Same thing in the web client, looks about the same as Android. I see a similar thing in iOS, except it is only visible if I tap on the clock icon. It is a yearly recurring task reminder I decided to reactivate to give reminders another chance. If the only way to not see it is to have a bunch of reminders that come sooner than that, that would seem less than useful if that's how it works. but﻿ in Android at the﻿ moment, I have a reminder at the top of the Note list for May 31st 2019, the only way I know to remove it is to mark it as done. Same thing in the web client, looks about the same as Android. I see a similar thing in iOS, except it is only visible if I tap on the clock icon. I think you're referring to the Reminder view. I don't use it. I prefer a shortcut to a saved search. This gives me control of which notes are listed. you can see a saved search on Android as well, either in the app or as a widget - I use this as a dynamic to do list. Yes, I also use saved searches in Android. I was referring to the fact that reminders occupy the top of the note list even if the event is far into the future, that makes them not so useful in Android. On the right side of the reminders is the menu icon, you can uncheck the second box, it will then not show future reminders anymore. Maybe that helps? I wasn't referring to wanting to disable all reminders, rather I was making the point that a reminder far into the future should not be seen, vs a reminder for next week, for example. If reminders in Android are an all or none proposition, they are not useful, in my view. There needs to be a setting to regulate when reminders are shown, the way they would in a Calendar app. I could make a counterpoint; I expect a list of reminders to show all reminders. In the note list together with and before all your notes? In Android, reminder view is not a separate view from the note list, that's what I was referring to. You previously mentioned you don't use this feature since you use a saved search instead. I would assume a saved search for reminders would show you reminders independently of the note list, (in Android) this might negate the need for reminder view. I am thinking about that approach as an option, will figure it out eventually. Notes with reminders are included in the note list. It's distinct from the note list section. On Macs, we get an optional Reminders section at the top of the note list. It's distinct from the note list section. I took a look at it on my ipad mini after adding a bunch of reminders. That does seem like the ideal solution, though I think I am beginning to understand a little the approach used on my Android phone. After playing with all the settings in EN Android for a while, it maybe better than a saved search, simpler at least, though iOS is much nicer. One thing missing from the IOS version is sorting by the reminder time with saved searches. Other than that, saved searches work well. Also, if your primary saved searches are reminder based, putting a prefix on them, exclamation point for example, keeps them at the top of the list. FWIW. EDIT: added phrase for clarity. One thing missing from the IOS version is sorting by the reminder time. Other than that, saved searches work well. Are you sure? It is true that I do not see reminder options to set in iOS like with Android, but all the test reminders I added are already sorted by reminder time, not by created or updated. Pretty much so for saved searches. So if you have a next seven day saved search for example, the results will be presented in whatever Note List Options you have set. With Windows you can use the view saving functionality to save the sort with the saved search. OTOH, if you click the reminder icon the searches are sorted by date. That doesn't suit my use case. Wow,! Impressive process discussion. Thanks, @Eldorado for getting the conversation started. ?